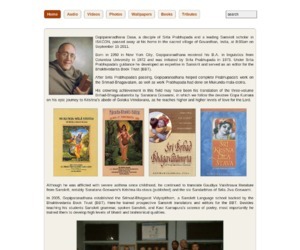 The official website of His Grace Gopiparanadhana Prabhu, helped complete Prabhupada’s work on the Srimad-Bhagavatam as well as the work on Mukunda mala stotra after Srila Prabhupada’s passing. The site contains Various audio, videos, wallpapers, Tributes, etc. Category Prabhus May 24, 2012 by ISKCON Desire Tree.